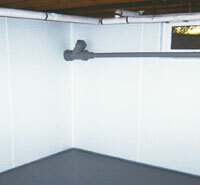 Installing a basement waterproofing system inside of your home is a fantastic idea. With all the innovations that have been made in the last decade on old-fashioned drain tile, French drain, and weeping tile systems in Ohio, along with the modern and more reliable sump pump systems, a waterproof basement is just a phone call away. If you have a wet basement and are looking for a solution, call Superior Basement Systems today for a free basement waterproofing inspection and quote! We serve Alliance, Ashland, Cadiz, Dover, East Liverpool, Hartville, Massillon, Millersburg, New Philadelphia, Salineville, Wooster, Yorkville and all areas nearby. Instead, Superior Basement Systems recommends installing BrightWall®, a plastic wall covering that is mechanically attached to the wall and can be installed as a vapor barrier. This easy-to-install basement wall covering will brighten the space and keep out moisture permanently. Covering a carpet with wood, chipboard squares, or carpeting will simply trap moisture underneath and lead to rot. 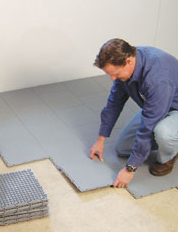 Instead, install an inorganic plastic floor tiling system such as ThermalDry® Basement Floor Matting. This tile creates a complete vapor barrier on the floor that depressurizes the space and prevents the natural upward of movement of water from the floor. As an added bonus, each tile sits on raised pegs, creating a thermal break underneath that will make the surfaces of each tile 8-10 degrees warmer than the cold floor below. Carpeting and other floorings can be installed directly on top of this floor matting. Both BrightWall® and ThermalDry® are available by Superior Basement Systems in Alliance, Ashland, Cadiz, Dover, East Liverpool, Hartville, Massillon, Millersburg, New Philadelphia, Salineville, Wooster, Yorkville and the surrounding areas in Ohio. 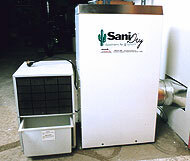 Superior Basement Systems has the answer to your dry basement needs: The SaniDry™ basement dehumidifier. This is the only dehumidifier available in Ohio that has the power and effectiveness you need. A sump pump contains mechanical parts, and like all appliances and utilities in your home, it will need routine maintenance. A brief annual visit by a service technician from Superior Basement Systems can make sure your sump pump is clean and that all parts are working properly. The service specialist will test the pump, check the sump alarm battery, and check the charge on your battery backup sump pump. 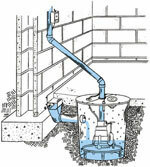 The sump and liner will be cleaned out, and problems with the discharge will be checked. 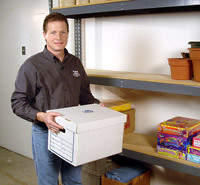 The technician can look for new emerging problems in the basement and will flood check the system to ensure it's working properly and your basement will be dry. Superior Basement Systems is the premiere basement waterproofing contractor in Alliance, Ashland, Cadiz, Dover, East Liverpool, Hartville, Massillon, Millersburg, New Philadelphia, Salineville, Wooster, Yorkville and other parts of Ohio. 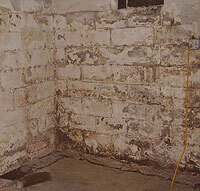 If you're in need of wet basement repair, we're ready to help. Waterproofing is our specialty, and with our great reputation in the community, you can be sure we'll be in business whenever you need us.